Hand made by me with airbrush and original paints! 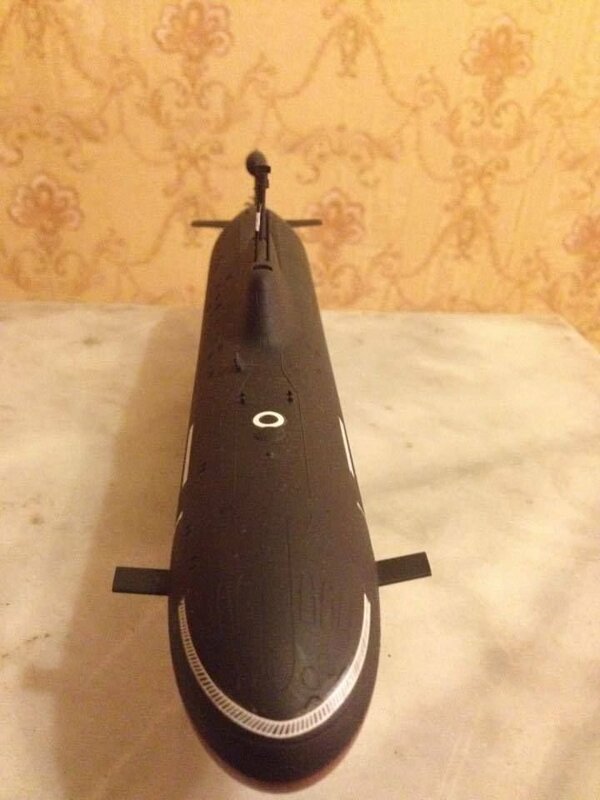 1:350 Akula class submarine complete model !Project 971 Щука-Б (Shchuka-B, 'Shchuka' meaning "pike", NATO reporting name "Akula") is a nuclear-powered attack submarine (SSN) first deployed by the Soviet Navy in 1986. The class is also known under the name Bars (meaning "snow leopard"). There are four sub-classes or flights of Shchuka, consisting of the original seven Akula Is, commissioned between 1984 and 1990; six Improved Akulas, commissioned between 1991 and 2009; one Akula II, commissioned in 1995; and one Akula III, commissioned in 2001. The Russians call all of the submarines Shchuka-B, regardless of modifications.The launch of the first submarine in 1985, according to defense analyst Norman Polmar, "shook everyone [in the West] up", as Western intelligence agencies had not expected the Soviet Union to produce such a boat for another ten years. Fast shiping worldwide with safe box with tracking number !